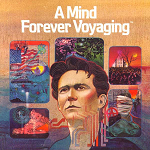 Difference between revisions of "A Mind Forever Voyaging"
* Inspired ''[[Potsticker]]'' ([[Nick Montfort]]; 2000; Z-code), entered in [[Speed-IF 13]]. * Internal/Working title was PRISM. * According to Steve Meretzky, the joke nickname for the game was "Steve Meretzky's Interiors", a reference to Woody Allen's Interiors, the comedy filmmaker's first major move into "serious" cinema.